Throughout the brief history of Android smartphones and tablets, apps have been largely viewed as the top way to play all sorts of games. With millions of titles available for installment on the Google Play Store, it’s no surprise. But when it comes to playing Android slots on mobile, is an app really better? A few years back, I would have nodded vigorously at such a question. Website development for desktop and mobile browsers was once the greatest caveat for internet gamblers. Fortunately, optimization has improved greatly since then. It’s no longer deemed important to download an app to play Android slots for real money. HTML5 web-coding saw to that. Around 2014-15, most digital casino operators went to great pains to convert their websites to HTML5 for the sole purpose of providing a seamless, parallel experience for all users. Thus the question of ‘Instant Play vs App Download‘ is received, and resolved, in a whole new light. And the reverse is now true. Playing Android slots instantly in a mobile browser has become the favored option for the vast majority of internet gamblers. Not only are mobile devices a lot faster and more secure, the instant play software presents many more advantages for players. Game variety is at the very top of that list. Combining HTML5 and Flash technology, Android slots come in a much wider variety when played directly. Developers must go to a lot more trouble to convert each individual game for inclusion in a mobile app, whereas the instant play variety – compatible with desktop and mobile – can now be built with a singular design. The difference in the number of games available is quite compelling. At Royal Vegas Mobile, for example, members who access the mobile slots app will have only around three dozen games to choose from. Microgaming’s absolute most popular slots are provided, along with a select few table games and video poker machines. That’s about it. 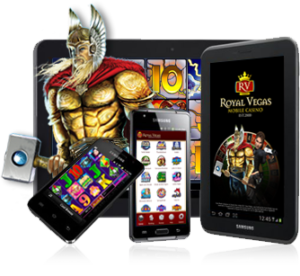 The instant play version of Royal Vegas, on the other hand, provides mobile users with an incredible 450+ games to choose from, including over 350 slot machines. Only the downloadable desktop-compliant casino (not available for mobile devices) has more games, having recently topped the 850 mark. As for graphic quality, there’s no real difference between the two. At least, not anymore. Downloadable apps were once recognized for presenting superior graphic quality. Now days, smartphone and tablet processors keep getting faster, and the HD-quality screen resolution is clearer than ever before. When it comes down to it, there’s only one real disadvantage to playing Android slots in a browser, instead of an app. Players must take a bit more time to access the instant play mobile casino. It’s a four-step process – open a browser, point to the casino website, log-in and click any game to play. Playing Android slots on a mobile app cuts the time in half, wherein the user clicks the casino icon on their device and is instantly taken to the gaming screen to tap a game. But realistically, we’re talking about less than a minute of time wasted to play in-browser.